Vumelana | Advisory Fund - When Companies Meet Communities: Is This What Friendly Commercial Farming Looks Like? “Gadco is the best thing that has ever happened to us as a people,” insists Atakli proudly, attributing this partly to his strong leadership and principled approach in negotiations. “Subjects have an inherent right to the land and you cannot deprive a subject of his property unless he consents, no matter how profitable the company may be,” he says. Atakli has good reason to emphasise this point. 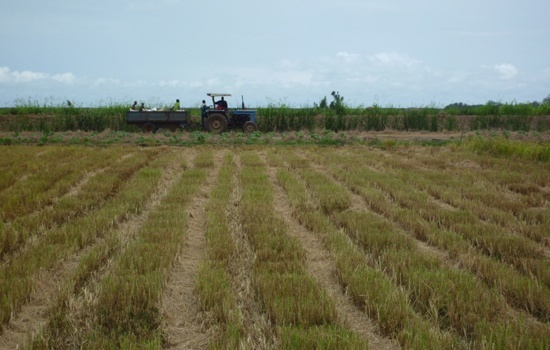 Stories abound in Ghana of foreign agribusiness acquiring the rights to vast swathes of land, uprooting locals from their ancestral homes, and building closed-off farms whose produce barely falls to the ground before it is whisked away in huge clattering trucks. These arrangements don’t drive local development so much as displacement − a fate that Atakli was adamant would not befall the Fievie − and can also come back to haunt the companies that make them. Fortunately for Gadco and the Fievie, their experiences over the same period could not have been more different to their rival’s down the road. While PVL was failing to meet targets and sinking into debt, Gadco was growing slowly but steadily. While PVL was getting caught up in clashes over land rights with locals, Gadco was successfully winning hearts and minds. And although Gadco’s operations didn’t start with a bang like Prairie Volta’s, it has not succumbed to a whimpering end yet either. 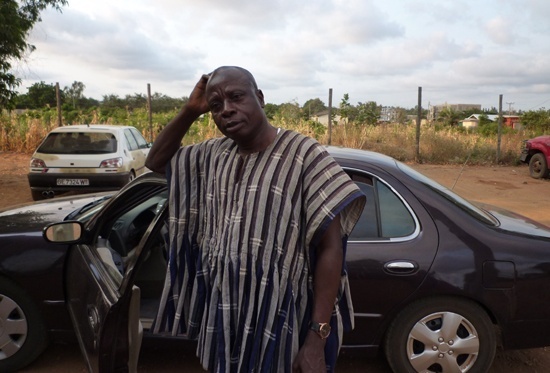 In fact, observers are now starting to point to Gadco’s project as an exemplar of how agribusinesses can be made to work, and last February, Ghana’s newly-appointed agriculture minister spent his very first day in office touring the company’s operations and celebrated the project as an example that ought to be replicated across the country. 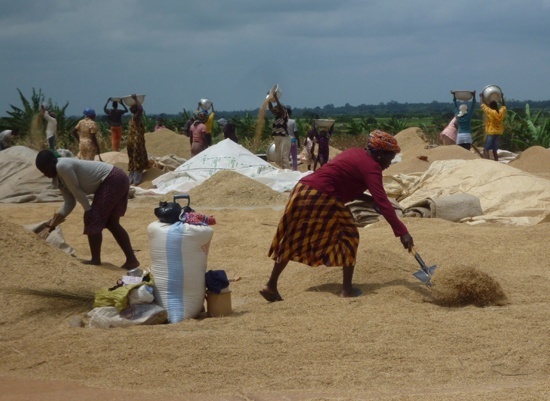 For many of Ghana’s struggling rice farmers, it was exactly this kind of help they needed, and for those approached by Gadco, the company’s promise of credit-free inputs and a guarantee to buy the farmers’ rice at market prices was warmly welcomed. 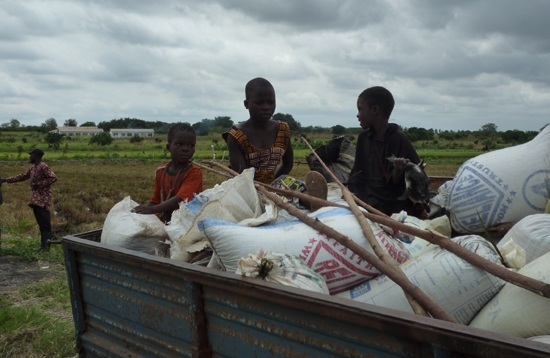 Many complained of previously having to borrow at 50-100% interest rates from local moneylenders to buy inputs and lamented their lack of access to markets which left them open to exploitation from rice buyers. 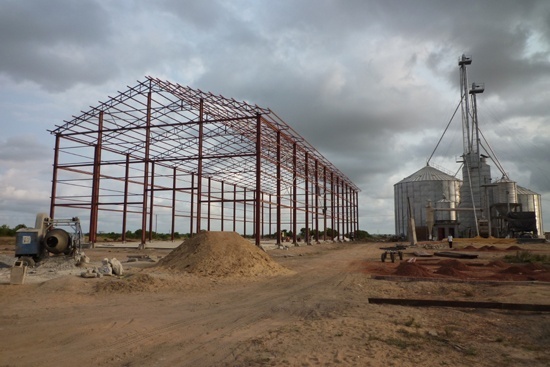 Gadco’s processing plant under construction. Looking across a neighbouring farm to Eric Glate’s. Nevertheless, the complaints of Gadco’s labourers – the one group the company can most easily replace and so arguably doesn’t need to try as hard to please – doesn’t reflect well, and some might be concerned that although other parties seem happy for now, the more the firm grows, the more it will be able to leverage its power to squeeze greater profits from those other groups too. There is a fundamental power imbalance between Gadco and its small-scale farmers, for example, which will only increase as the company develops a stronger monopoly on inputs and markets. 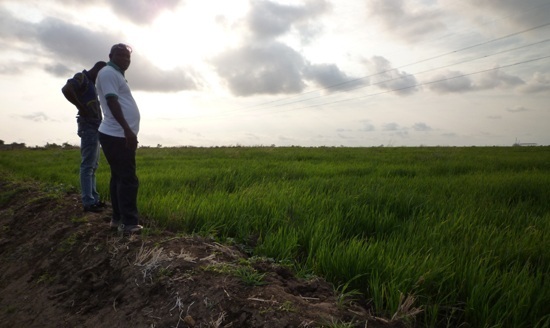 Julius Ameku, Gadco’s community manager, gazes across the company’s nucleus farm. For many observers, however, the biggest danger faced by those involved with Gadco is not so much that the firm will start acting in an intentionally malign manner. Rather, they fear that as this one company integrates itself into so many locals’ lives, the potential fallout if there are any setbacks − or if the firm collapses completely − could be huge. “It bodes well the farmers seem very happy, but we also need to see what happens if things go wrong,” warns Harrigan.